Major broadcast and cable news networks are failing in their coverage of the transgender community, prioritizing sensational depictions of transgender people while ignoring important transgender stories, including the recent murders of seven transgender women of color, according to a new Media Matters report. Broadcast, cable, and national Spanish-language news networks struggled to appropriately report on stories related to the transgender community -- when they choose to discuss those stories at all. 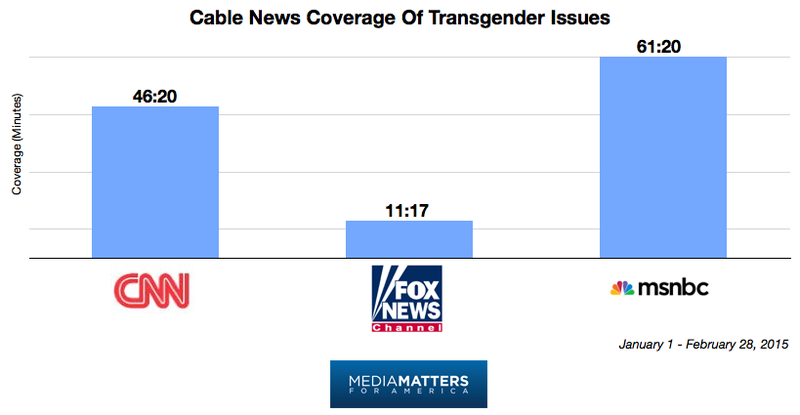 A Media Matters report tracking transgender coverage on CNN, Fox News, MSNBC, ABC, CBS, NBC, Telemundo and Univision in the first two months of 2015 raises concerns over the types of transgender stories being told in news media and the extent to which transgender people are allowed to speak for themselves on national television. 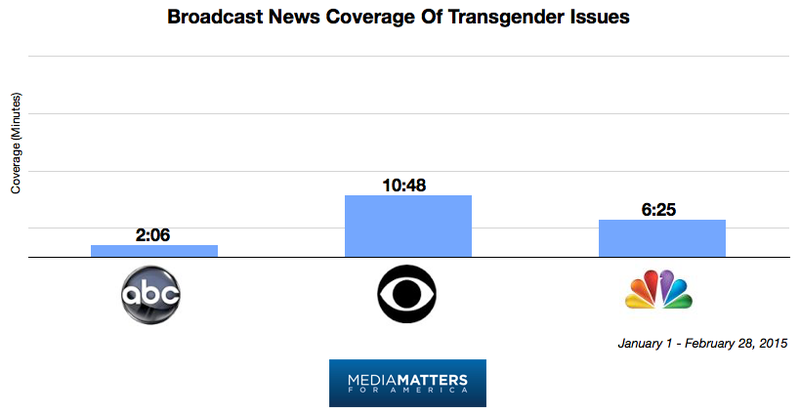 Which Transgender Stories Are Newsworthy? 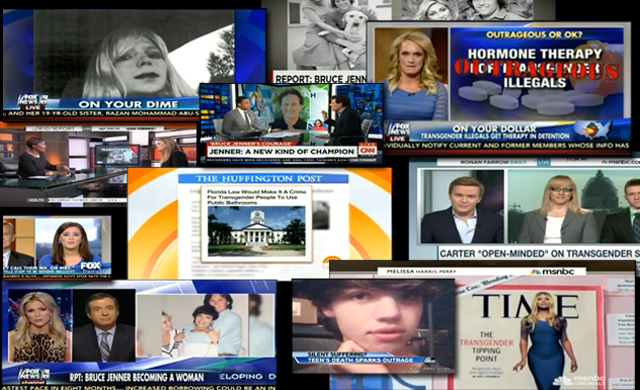 When networks did discuss transgender stories, coverage was largely focused on the unusual circumstances of high-profile transgender individuals, rather than the shared experiences of the transgender community. Though CNN spent forty-six minutes discussing transgender issues, for example, over 80% coverage was centered on TV personality Bruce Jenner’s transition. While a few news hosts, including MSNBC’s Melissa Harris Perry and CNN’s Don Lemon, used these stories as opportunities to talk about broader issues affecting the transgender community, the norm was overwhelmingly in favor of focusing on the particularities of already sensationalized news events. The media’s focus on stories like Jenner’s can’t be blamed on the lack of substantive trans-releated news events. But their deaths went unnoticed by national media outlets. According to our report, not a single cable, broadcast, or national Spanish-language news network hosted a discussion about the murders in the first two months of 2015.
Who gets to be mourned publicly is always a political question with very real political and material consequences. Paying attention to who gets front page coverage of their grief, whose life is counted as grievable, and whose life is even “worth” grieving publicly helps illuminate which deaths remain invisible and which lives are rendered ungrievable altogether. Beyond stories about transphobic violence, news networks also largely ignored the emergence of several state bills aimed at denying transgender individuals access to places of public accommodation, including measures that would institute harsh penalties for trans people who try to use public restrooms that correspond with their gender identity. These measures are almost exclusively motivated by the right-wing myth that sexual predators will pose as transgender in order to sneak into women’s restrooms. But the only mention of any such measures on English cable and broadcast news was a 30-second mention on the February 10 edition of NBC’s Early Today. 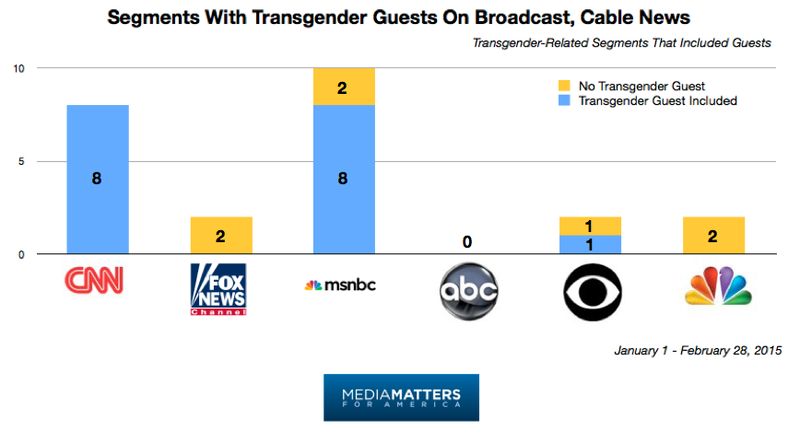 CNN and MSNBC, on the other hand, included trans guests in nearly all of their substantive segments about transgender issues. When those guests were allowed to speak about their experiences and community, the impact they had on the tone and content of media coverage was nothing short of transformative. [O]nly 8% of Americans say they personally know someone who is transgender. Given this reality, most Americans learn about transgender people through the media. So when the media talks about transgender issues - it is imperative that they get it right. Getting it right means reporting on the lived experiences of trans people, and giving the most marginalized members of the community -- not just transgender celebrities -- a platform to educate viewers about the issues that affect them the most. It means refusing to perpetuate myths and stereotypes about trans people, and exposing lawmakers and activist groups who use scare tactics to lobby against basic protections for the transgender community. But sensationalizing stories like Bruce Jenner's transition or Chelsea Manning’s hormone therapy creates a wildly unrealistic depiction of what it’s actually like to be trans -- a problem that's aggravated when transgender people aren't invited to speak on behalf of their community and experiences.